Here is the KPSC Group A & B Recruitment 2019 Notification is announced by the officials of Karnataka Public Service Commission for the Kar Gr A B Vacancy 123 posts are in the count. KPSC Group A & Group B Recruitment is available from 20 March 2019 which is valid from 22 April 2019. This KPSC Group a b Technical vacancy advertisement released & interested applicants can apply from 20 March 2019 to 22 April 2019 through the official website www.kpsc.kar.nic.in recruitment official page. Karnataka Group A B vacancy 2019 is available Through this Recruitment the Karnataka government is going to pick up the aspirants for the 123 posts of group A B Posts. The interested applicants may enroll this KPSC Group A B Recruitment notification through the online official website. The applicants can pay the application fee while filling up the KPSC Group A B application form through the online mode which is available 20 March 2019 to 22 April 2019 The candidates should pay the fee according to their respective category 20 March 2019 to 22 April 2019 using the online banking. For clear information according to this recruitment follow our website @recruitmentindia.in. 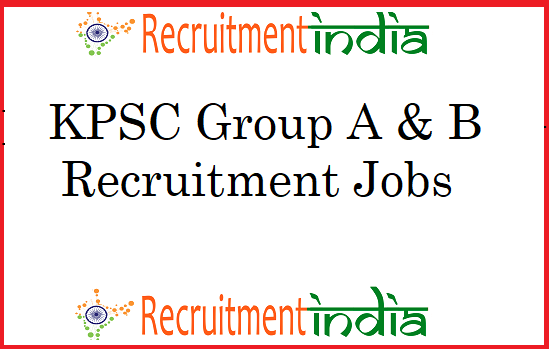 Karnataka Group A B Recruitment 2019 Here we convey the data to the contenders that who are pleased to apply for this KPSC recruitment notification.that is the basic info about the number of vacancies and location and also all eligibilities for this Karnataka Group A B Notification. The contenders who are satisfied with these limitations given by the officials of Karnataka Public Service Commission can apply for this recruitment through the official site. And also the contenders get the latest Karnataka govt Job Notifications here. For details about this KPSC recruitment notification read the article completely. Post Graduate, MBBS or equivalent from a recognized Institute for KPSC Recruitment 2019. Here we also inform that the candidate’s for the KPSC Group A & B Application form for the selection process is Written test and Final interview. For this written test, we give the syllabus to the candidates for making their preparation easiest. And also we give previous papers for the seeking of the candidates. So, the candidates can log on to our website and download the syllabus and sample papers here. The candidates can get the data here that is how to fill the application form and also steps for downloading the papers. After completion of the Kar Group A & B application form process, the officials will release the admit cards very soon. The applied candidates who completed their written examination can get the Results as soon as possible. The qualified candidates are only eligible for the final interview. So the candidates prepare well and give the assessment test. The applicants want to know more about this notification follow official website or our page about the kpsc.kar.nic.in recruitment. Enroll in the official website @ kpsc.kar.nic.in. Open Home Page, Click on KPSC Recruitment 2019 Notification. Take a hard copy of the application form for future reference. Can MCA graduate can apply for this job? Can MCA graduate apply for this post? ?